I pretty sure the following story comes as no surprise to anyone familiar with Ole Miss. The only thing that has ever really bothered me about this school is the fact that Black parents continue to send their children to a school where the mascot is the Rebels as in the Confederacy Rebels. I've never been able to wrap my mind around that one. Maybe it's just me. 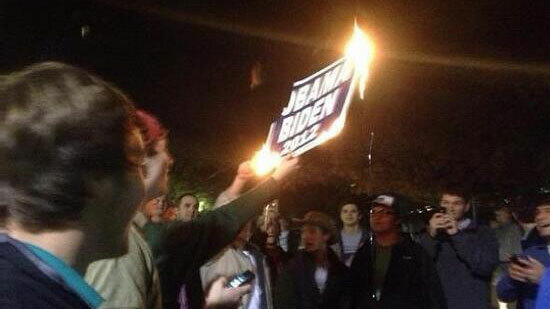 At the University of Mississippi on Tuesday night, hundreds gathered at the student union to protest the re-election of President Barack Obama. The reports of the use of racial language by some have been confirmed by our campus police. The University leadership strongly condemns this kind of behavior and is embarrassed that any students associated with the university would use this kind of language. Our university creed calls for the respect of each individual and for fairness and civility. The investigation of this event will be thorough and individuals found in violation of any law will be referred to appropriate authorities. Individuals found in violation of university policy will be dealt with appropriately through the student conduct process. The University of Mississippi is often a lightening rod for racial issues. In September 1962, the school was desegregated, amid protests, fires, and riots. Two people died and hundreds were injured in the chaos. This year, the school is celebrating its 50th anniversary of the day James Meredith, the school's first African American student, enrolled. The campus is decorated with posters declaring, "50 Years of Integration: Opening the Closed Society" and "50 Years of Courage." Earlier this year, the school elected Courtney Pearson its first African American homecoming queen. Pearson told Ole Miss News that her victory is a sign of continuing change on the campus. "It couldn't have come at a better time," she said. "Ole Miss, get ready. We just changed the face."